10 basic biomes and habitats in a fun online geography educational game. 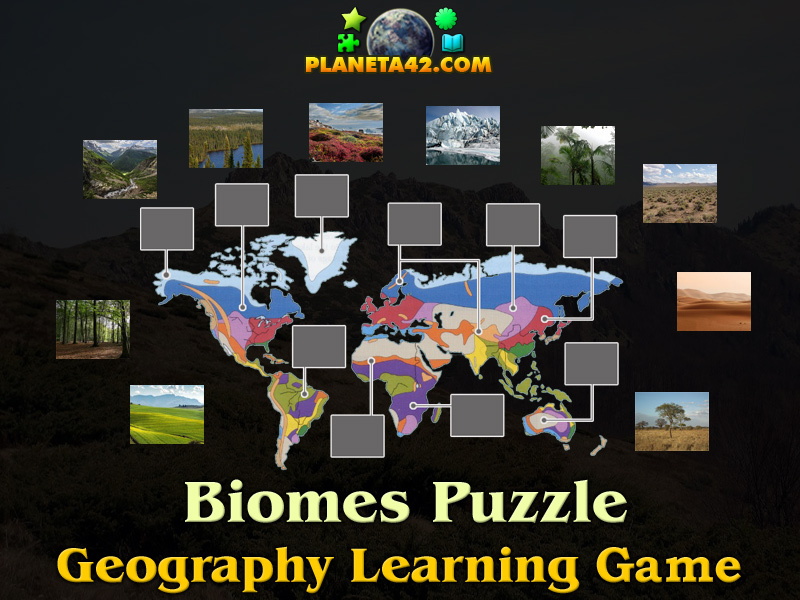 "Biomes Online Puzzle" is a free online knowledge level game, about the location of terrestrial biomes on the world map. Drag and drop the habitat pictures in their correct places. A small educational game for desktop computers, laptops and tablets, which may be played in the web browser. The Geography Knowledge Board include 10 basic biomes to play with. 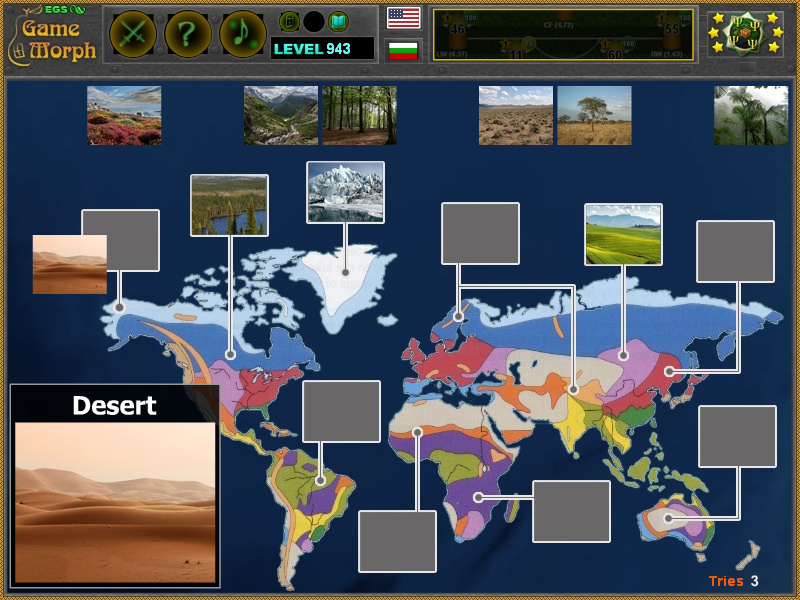 The game is part of the Interactive World Maps educational tools. You may also like a biome puzzle for every continent: Africa Biomes Puzzle , Europe Biomes Puzzle , Asia Biomes Puzzle , North America Biomes Puzzle , South America Biomes Puzzle , Australian Biomes Puzzle. Where are different biomes locations? Are biomes affected by the geographical position? Is a desert a biome? How to play Biomes Online Puzzle. There are 10 pieces of biomes, situated on the top of the screen. Drag and drop them in the correct location on the world map. If dropped incorrectly, the pictures will go back to their original place. There is a small counter to the bottom right. It is, as always, used only for evaluation in fun classes and will not affect the knowledge level achievement. 10 tries for "A" and more than 18 tries for "F". Know 10 biomes, their appearance and get +1 Knowledge Level. A biome is a community of plants and animals that have common characteristics for the environment they exist in. They can be found over a range of continents. Biomes are distinct biological communities that have formed in response to a shared physical climate. "Biome" is a broader term than "habitat"; any biome can comprise a variety of habitats. The game will not give a complete list of all biomes, but rather a fun compilation of most important(included in many strategy games) ones. Labels: Puzzle Games , Interactive Maps , Flash Games , Geography Games , Education Games , Free Online Games.